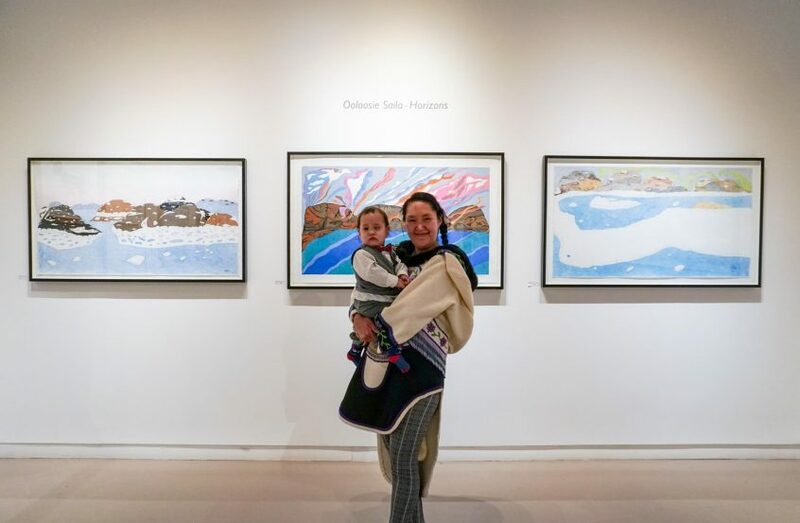 It’s hard to imagine what was going through Ooloosie Saila’s mind as she made her long pilgrimage to Toronto from her home in Kinngait (Cape Dorset). It’s always an adventure when flying across the Arctic, with multiple flights to catch and unpredictable weather. Ooloosie wasn’t just making her second trip south of the Arctic Circle and her first time in Toronto, she also had her one year-old son, Pallu in tow. Landing in Toronto, mother and child had several days to acclimatize. 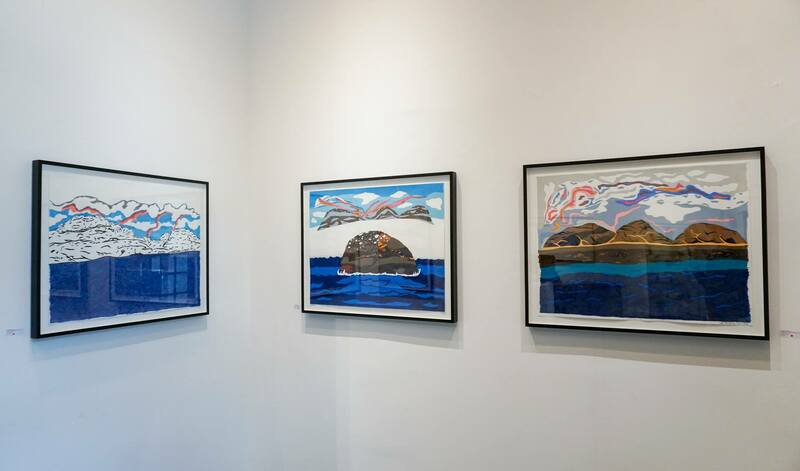 The object of this trip was another first for Ooloosie – her first solo show: Horizons. At the age of 27, that’s a remarkable achievement. Even Ooloosie couldn’t have anticipated the response awaiting her later in the week with the opening of the show. In the meantime, the mother and son enjoyed the thrill of taking a subway for the first time. Dressed in her traditional Amautiq, a combination of baby carrier and winter coat, with Pallu standing in the hood, mother and son drew a great deal of curious attention on the subway, smiling and answering the questions of passersby. They also went to the top of the CN Tower seeing the big city from an entirely different perspective. 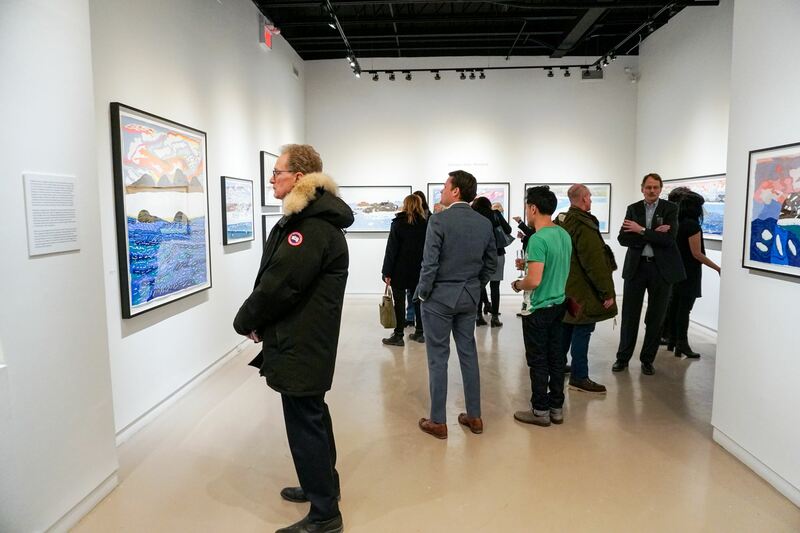 Feheley Fine Arts alumnai Brad van der Zanden offered the Sailas a private tour of BMO’s collection. 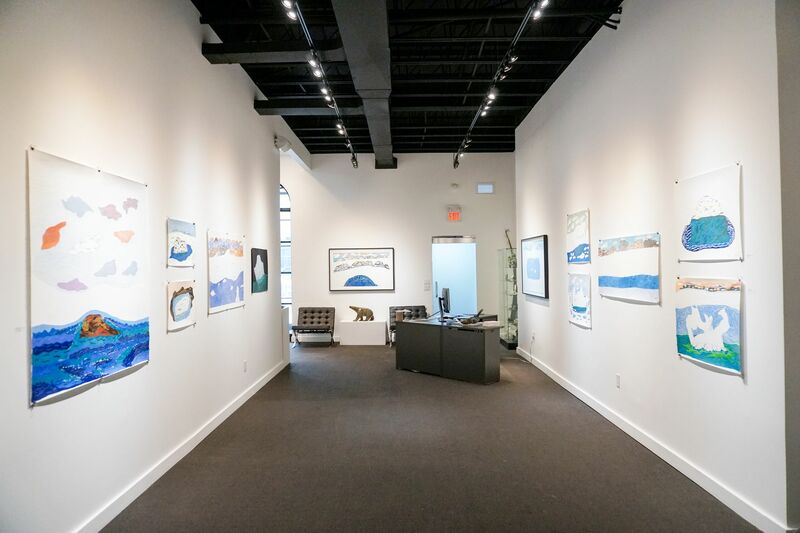 Living within easy access to numerous galleries, we take for granted the power of the experiencing art first hand. Ooloosie was clearly inspired by viewing some of the great work done by her predecessors. 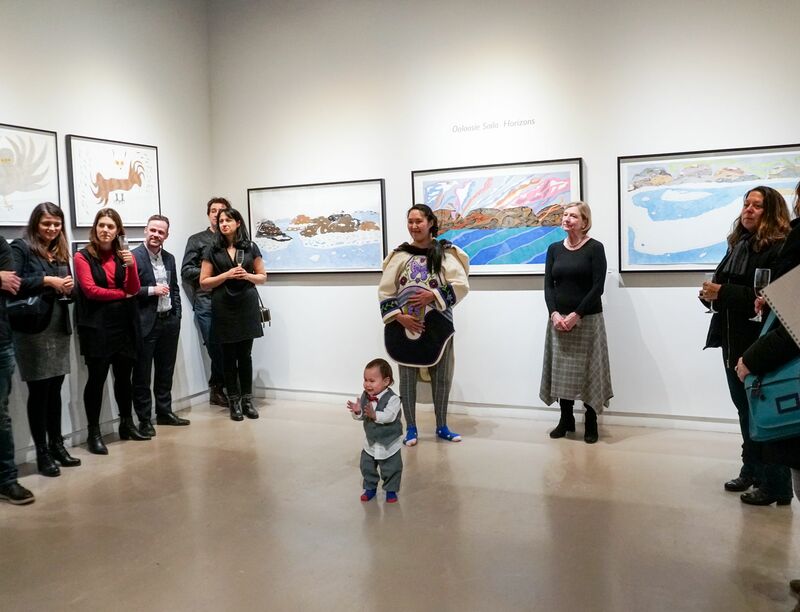 But this week was dedicated to the new generation of Inuit artists, represented by the clear emergence of Ooloosie Saila as a force on the Canadian art scene. On the day of the opening, a childhood friend of Ooloosie brought a suit for Pallu to wear. People were eager to take photos with her, ask her questions and shake hands. The scene had a lighthearted tone thanks to the bouncy presence of baby Pallu and her own ever-present smile. While collectors and curators look forward with great anticipation to her future, Ooloosie herself was deeply moved by the interest and enthusiasm for her work. A large majority of drawings were sold on opening day. The response was nothing short of phenomenal – a clear indicator of what’s to come for this exceptionally talented artist. First shows can be nerve-wracking. Not this one. Ooloosie’s grace under pressure was only exceeded by the bold, yet graceful lines of her work. 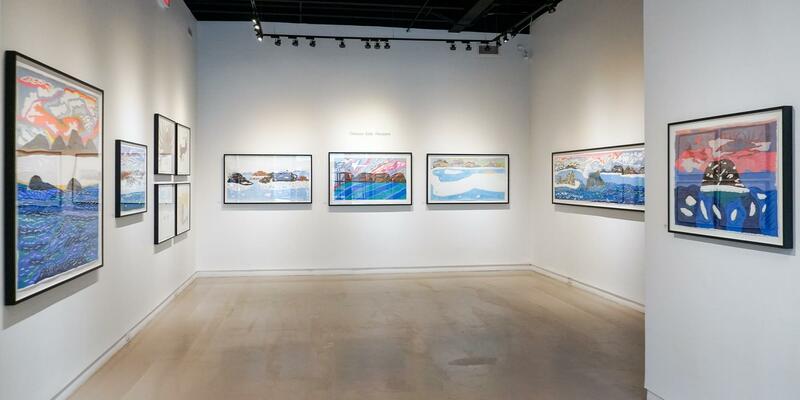 Ooloosie Saila: Horizons continues at Feheley Fine Arts until March 30th.